Switzerland occupies a top position on most global rankings of well-being and quality of life, which has often been attributed to Swiss exceptionalism. 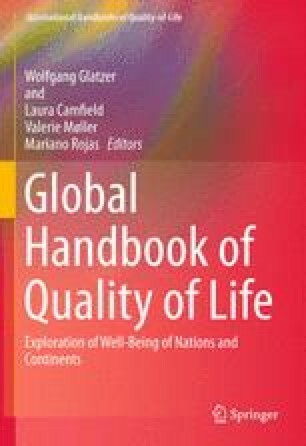 This chapter traces back this exceptional pattern of well-being until the early 1960s, when one of the first quality of life studies of the country diagnosed a “Swiss malaise”, caused by a contradiction between the high material well-being and the societal norms demanding ascetic lifestyles. Our analysis of the evolution of societal and individual well-being over the past decades across the various key areas and life domains, for both objective living conditions and subjective evaluations and satisfaction suggest a softening of these inconsistencies and a normalisation of Swiss exceptionalism. The Swiss pattern of well-being and quality of life has thus moved from a constellation of “dissonance” towards “well-being” and “adaptation”. Annoni, P., Bilbao-Osorio, B., Blanke, J., Browne, C., Campanella, E., Crotti, R., Dijkstra, L., Drzeniek Hanouz, M., Geiger, T., Gutknecht, T., Ko, C., Sala-i-Martin, X., & Serin, C. (2013). The global competitiveness report 2013–2014. World Economic Forum. Resource document: http://www3.weforum.org/docs/WEF_GlobalCompetitivenessReport_2013-14.pdf. Accessed 20 Nov 2013. Bergheim, S. (2010). The progress index: Measuring and comparing progress. Resource document: Zentrum für gesellschaftlichen Fortschritt . http://www.fortschrittszentrum.de/dokumente/2010-11_Fortschrittsindex_E.pdf. Accessed 28 Nov 2013. Blocher, C. (2000). Gedanken zum Geheimnis eines erstaunlichen Erfolgs. Den Sonderfall Schweiz begreifen. Alibsgüetli-Rede. Schweizerzeit 3, 28 Jan 2000. http://www.schweizerzeit.ch/0300/leit.htm.Accessed 17 Oct 2014. Brandmeir, K., Grimm, M., Heise, M., & Holzhausen, A. (2013). Allianz global wealth report 2013. Resource document: Allianz. https://www.allianz.com/v_1380187782000/media/economic_research/publications/specials/en/AGWR2013e.pdf. Accessed 20 Nov 2013. Crettaz, E., & Suter, Ch. (2013). The impact of adaptive preferences on subjective indicators: An analysis of poverty indicators. Social Indicators Research. Online first. doi: 10.1007/s11205-013-0388-6. Eurostat. (2013). Resource document: Eurostat. http://appsso.eurostat.ec.europa.eu/nui/submitViewTableAction.do?dvsc=7. Accessed 20 Nov 2013. Gedmin. (2013). 2013 The Legatum prosperity index. Resource document: Legatum Institute. http://media.prosperity.com/2013/pdf/publications/PI2013Brochure_WEB.pdf. Accessed 20 Nov 2013. Gesis. (2013). Social indicators Monitor (SIMon). Resource document: http://gesis-simon.de/simon_eusi/index.html. Accessed 9 Oct 2013. Heritage Foundation. (2013). Index of economic freedom. Resource document : Heritage Foundation. http://www.heritage.org/index/. Accessed 26 Nov 2103. Malik, K., Kugler, M., Kovacevic, M., Bhattacharjee, S., Bonini, A., Calderon, C., Fuchs, A., Gaye, A., Konova, I., Minsat, A., Nayyar, S., Pineda, J., & Waglé, S. (2013). Human development report 2013: The rise of the sun. Resource document: UNDP. http://hdr.undp.org/en/media/HDR_2013_EN_complete.pdf. Accessed 20 Nov 2013. OECD. (2013a). Life satisfaction. Resource document: OECD. http://www.oecdbetterlifeindex.org/topics/life-satisfaction/. Accessed 20 Nov 2013. OECD. (2013b). Better life index. Resource document: OECD. http://www.oecdbetterlifeindex.org/#11111111111. Accessed 26 Nov 2013. Poget, J. (2012). 1964: L’Expo ose le doute de soi. Resource document: Journal 24 heures. http://www.24heures.ch/vaud-regions/1964-expo-ose-doute/story/26266665. Accessed 21 Nov 2013. Stadt Zürich. (2013). Statistisches Jahrbuch der Stadt Zürich. Resource document: city of Zurich. https://www.stadt-zuerich.ch/prd/de/index/statistik/soziales_und_gesundheit/sozialhilfe.secure.html. Accessed 25 Nov 2013. Veenhoven, R. (2013). Happy life years in 149 nations 2000–2009. Resource document: World Database of Happiness, Rank report Happy Life Years. worlddatabaseofhappiness.eur.nl/hap_nat/findingreports/RankReport_HappyLifeYears.php. Accessed 20 Nov 2013. World Bank. (2013). Resource document: World Bank. http://donnees.banquemondiale.org/indicateur/NY.GDP.PCAP.CD?order=wbapi_data_value_2012+wbapi_data_value+wbapi_data_value-last&sort=desc. Accessed 20 Nov 2013. Zahidi, S., Bloom, D. E., Milligan, P. A., Guzzo, R. A., Harding, C., Soo, A., Nair, D., Riggieri, A., & Chen, L. (2013). The human capital report. Resource document: World Economic Forum. http://www3.weforum.org/docs/WEF_GlobalCompetitivenessReport_2013-14.pdf. Accessed 20 Nov 2013.